Along with fabric, patterns, pins and thread, tools are very important in getting the results we want in our quilt making sessions. One tool that I love is my pair of small scissors that I keep right by the sewing machine to clip threads, snip off dog ears and other small tasks that I can do right there. I first found these scissors when I was preparing a sample for a Trapunto class. Trapunto is that beautiful raised stuffed work – part of the process is cutting away polyester batting close to the stitched design. 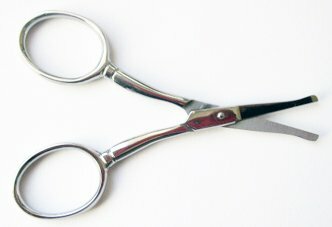 Polyester is notorious for dulling scissors and I was very pleased to find that these stayed sharp even after cutting through what seemed like mountains of batting! Now I have three pair – one by the machine, one in my travel supplies (YES, they are blunt tipped and small enough that you can take them through airport security, at least in the US) and the third in my workroom where I can quickly grab them to trim threads from quilts in progress. They have proven to be just the scissors that I needed – another essential quilting tool!